"The court lies to the north of the Temple Church; the house against which the tombs are placed is that of the Master of the Temple. 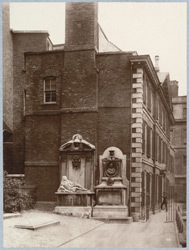 The tomb with the recumbent figure is that of John Hiccocks; that with the bust, of Samuel Mead, both removed from the church (Allen's History of London, IV., 400). The tomb in the foreground is that of Oliver Goldsmith, placed here in 1860. The great writer was actually buried in this Churchyard, but the exact position of his grave is uncertain."